It’s probably safe to say that no food has been the subject of more humor than beans. There is an amusing line in a western story where one cowboy queries the other about what’s for dinner. “Well,” the old geezer drawls, “last night we had beans ‘n hardtack and tonight we’ll be havin’ hardtack n’ beans!” Of course, there is also that famous scene from the movie "Blazing Saddles" that revolves around the digestive effects of eating beans. For some reason, beans have generally been considered the “low-class” members of our food supply. 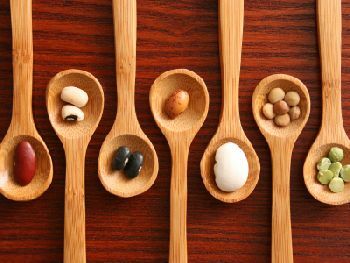 If you want to characterize a meal as not only monotonous, but also cheap, it will often consist of some form of beans. Cooking with beans, an inexpensive source of nutrients. There is no question that beans are an economical choice for your food budget. What you may have missed is that they are also a nutritious choice, since they are loaded with nutrients including protein, fiber, vitamins and minerals. However, you may be avoiding eating beans due to the effect they can have on your digestive system. 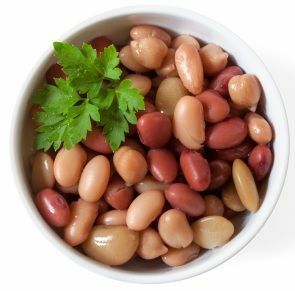 While this is a concern, and maybe even a deterrent, there are some things you can do to avoid the discomfort that may accompany including beans in your diet. -Dry beans should be sorted before cooking. This can be done by spreading the dry beans out and removing any foreign particles. -Most dry legumes, with the exception of split peas and lentils, need to be soaked before they are cooked. There are two methods for doing this, and either method is effective. Note: This method seems to remove more of the gas-producing compounds. **Check the description of each bean below for specific cooking times. -Do not salt the water until beans are done cooking. Salt will slow down the cooking time and toughen the bean coats. Other spices and vegetables may be added, however. -If beans are older and drier, with a wrinkled appearance, they will take longer to cook. -If foam forms on top of the water when you are cooking beans, skim it off and continue cooking. -Beans should be tender and the skins beginning to loosen when they are done. See particular bean for approximate cooking time. 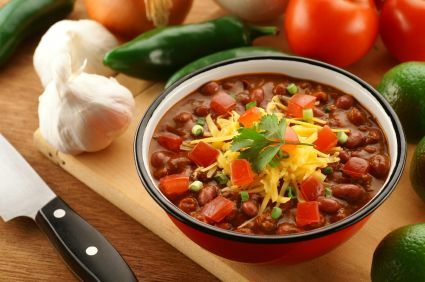 -If you are using more than one variety of dry beans in a recipe, it is better to cook each type of bean separately, and then add them to your chili or other dish. This is because the beans will be fully cooked at different times, and you may end up with some overcooked, mushy beans or some under cooked, hard beans if you cook them all together. -Cooked beans freeze very well, so you may want to cook larger batches of beans and then freeze some for quicker use in the future. Beans and legumes come in a wide variety of sizes, shapes, colors and flavors. They are economical and nutritious. With proper handling the potential digestive issues can be resolved. Try adding some beans to your healthy menu plans. I don’t know about the hardtack, though. Click here to go from Cooking with Beans to Vegetarian Diet page.